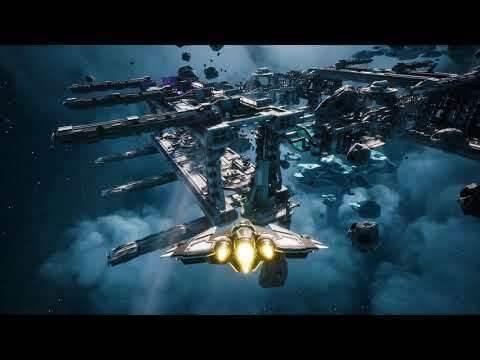 Encounters is the first major expansion for EVERSPACE™, enriching the game world with new story characters and questlines, a brand-new player ship, freighter-loads of novel equipment, additional enemies, and much more. This expansion is as of now available on Steam and GOG. We currently can't give you a release date for the Xbox and Windows Store, as we currently don't have a working Windows Store version. Impress your peers with the new Colonial Sentinel, a medium fighter craft, and make use of its powerful shield and advanced electronic warfare capabilities. Mileage may vary. Play five new quest lines and meet new characters, each with their own motivations and agendas. Ever met a robot bounty hunter with a French accent who would rather create than destroy? Of course not. Or an alien scientist who sends you on a hunt for space creatures? That's right. Creatures... in space. Six new primary and secondary weapons, such as Lightning Guns and Plasma Throwers, will ensure continued enjoyment when dispatching your opponents. Ever wanted to barrage multiple foes at once with projectiles? The Seeker Missile Battery aims to please. You deserve this. EMP Generators? Decoy Holograms? Why, yes! More than ten additional devices and consumables will make surviving Cluster 34... as hard as before. But even more fun. If you're not too busy dying, the new G&B factory stations are well worth a visit. Here you can upgrade your ship, refine resources, and delay your inevitable fate by means of repairs. If a simple paint job didn't do it for you, why not fly in style with one of the five new fashionable ship skins? And if your journey isn't challenging enough already, we've got you covered with even more achievements. Happy hunting, pilots. Try not to die. I suppose that this expansion isn't included as a bonus reward for backers from the Kickstarter campaign, right? Only if you purchased the Space Pro tier or higher (which includes "Life time season pass to get upcoming DLCs for free"). It still is, though we ask for your patience as this will take some time to do so. More details will be made known as progress is made, don't worry! Waoh, the ship and new equipments from this expansion are quite nice ! but didn't find any plasma thrower yet By the way, are there "mk2" versions of Lightning gun and Plasma thrower ? The single Lightning Gun and Plasma Thrower (as well as the Goo Gun and Neutron Cannon) are the only versions that exists. The expansion is beyond fantastic. Well worth the asking price and more. I think this game is the one to convince myself I need a VR set-up. Great job, people. Any idea how we check our tier? Checking the email associated with your Kickstarter account should have sent you a receipt of which tier you purchased. There are also badges that help identify certain tiers as well (for instance, your badge says "Kickstarter Alpha Backer, Space Rogue," which indicates you are the Space Rogue tier). Space Pro (Pledge €250 or more) is the first tier to offer the game's lifetime season pass to get upcoming DLCs for free. Io non ne posso più di aspettare...voglio l'ultimo aggiornamento sulla mia Xbox One...vi prego!!!! Hello @lucianoangelini, XBox One's update is coming February, 2018. Thank you for your continued patience as the team optimizes the content for the console! Just got a new Xbox last night. Games looks and runs amazingly. Totally worth the price (cheaper than upgrading my PC to run it the same way). Looking forward to the update. I'm playing it on PC and it looks gorgeous. It looked gorgeous in Early Access too. I regularly check this forum to find out if there is any news on the Xbox expansion....can't wait! Next week, we'll start working on bringing Encounters to the entire Xbox family. Again, making sure the DLC also unlocks properly on UWP will be the main challenge. Should be just a matter of weeks. Annnnnnny news for us Xbox guys and gals? I check in every week to see if any new news is out about the expansion. Really could do with playing this game again, but want to wait for the new content first. How successful has the game been? I’m pretty sure you won’t answer this part, but I really do hope it was a successful and you will continue to update and improve, this game hooked me for weeks, and really could do with playing a decent game again! We're currently working on the expansion for xbox - we're still busy setting the whole thing up in the microsoft/xbox store backend. We'll probably need a couple more days till it's done and then we have to go through certification (which can take days or weeks, depending on the problems that occur). There are no plans for further expansions or major updates after this one. Ciao Ragazzi, a che punto siete con l'espansione Enc per Xbox? Un Gioco tipo questo con in più la possibilità di scendere sui pianeti alieni sarebbe stupendo. Hi we've made good progress and submitted the expansion to Microsoft just yesterday. Let's hope that it passes certification without any problems. Either way, it looks like you won't have to wait much longer. A che punto siamo con Enc per X Box?